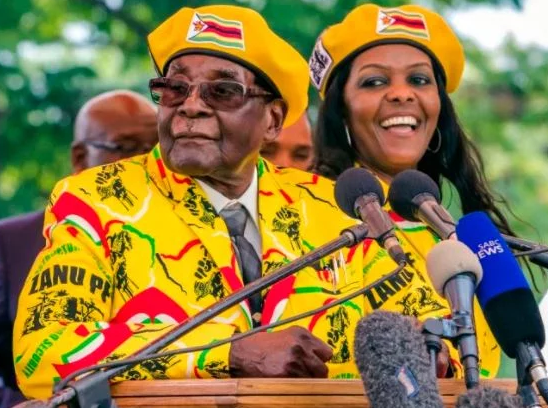 Former Zimbabwe president Robert Mugabe and his wife Grace Mugabe will get a 'Golden goodbye’ payoff of at least $10 million, including legal immunity for himself, his family and a salary paid for life. The former dictator reportedly struck the deal as part of his resignation last week, after governing the country for 37 years. The Guardian reported a Zanu-PF insider close to the deal revealing the exact cash pay off is unknown but it will ‘not be less than $10million’ with $5million being paid now and the rest in installments. A senior official of the ruling ZANU-PF party who spoke on the agreement said the total would not be less than $10 million, local media reported. “Government will give him US$5 million lump-sum and then the remainder to be paid out in installments,” a source was quoted as saying by local Zimbabwe Independent. According to the details of the agreement, Mugabe will also receive immunity from prosecution. Besides, the new government under Emmerson Mnangagwa will not take any action against his family’s extensive business interests. His 52-year-old wife, dubbed as “Gucci Grace” for her extravagant lifestyle, will also receive half that amount for the rest of her life. The couple will be also be allowed to stay in their mansion in Harare, known as the Blue Roof and the state will pay for their medical care, domestic staff, security and foreign travel. Opposition leaders have criticised the agreement saying that the law does not guarantee immunity to the former president, including Douglas Mwonzora, secretary general of the Movement for Democratic Change who spoke against it. “We are not privy to any deal reached with Mugabe, and if there is any deal on money or anything else it is unconstitutional,” said Douglas Mwonzora, secretary general of the Movement for Democratic Change, the main opposition party, was quoted as saying by The Guardian.